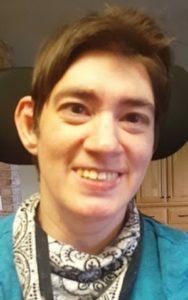 Christina “Christie” L. Dochter, 36, passed away following a courageous battle with cancer on January 25, 2019, at her Friendship Community home in Lititz. Born in Lancaster, she was the loving daughter of John W. and Maryanne I. (Helfrich) Dochter. She enjoyed the Mrs. Doubtfire and Mary Poppins movies and listening to Kids Cookie Break on WJTL. Christie’s many activities included baking cookies, singing and listening to music, shopping, decorating, word-worship and fishing. She was active in Handicamp and Meaningful Day Academy. Her favorite color was purple. Christie’s family includes her parents John and Maryanne; her siblings, Matthew Dochter, husband of Melissa and Caroline, wife of Matthew Zimmerman and their daughter Lily Zimmerman, all of Maryland; and many aunts and uncles. Christie’s family extends a heartfelt thank you to the staff of Friendship Community and Masonic Village Hospice for the loving care they gave to Christie. A Celebration of Christie’s Life will take place 4 PM Tuesday, January 29, 2019 at Hosanna! A Fellowship of Christians, 29 Green Acre Road, Lititz, PA 17543, with Chaplain Milt Stoltzfus officiating. A casual greeting time will take place from 3 to 4 PM. Please wear something in purple or bright colors. In lieu of flowers, kindly consider a memorial contribution to Friendship Community, 1149 E. Oregon Road, Lititz, PA 17543. So sorry to hear of your loss. I did not know Christie but it sounds like she led a full and joy filled life. In her picture she had a beautiful smile and a light in her eyes! I am sure that the love of her family enriched her life beyond all expectations. She is now in the company of God, smiling down on you all. I will keep you all in my daily prayers. John and Maryanne, I am so sorry for your loss. May God grant you his grace, comfort and solace as you mourn for Christie. Eternal rest grant unto her O Lord, May she rest in peace.